Happy Valentine’s Day! This dessert is a little brainstorm I got last weekend when I realized it was three days from Valentine’s Day and I hadn’t thought of anything to make yet. 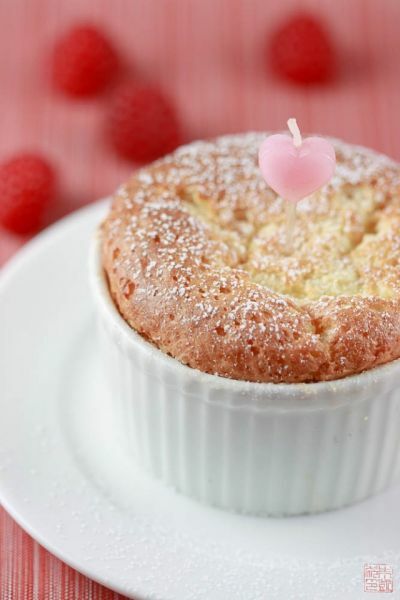 I wanted to take a classic V-day dessert and give it a little modern spin. 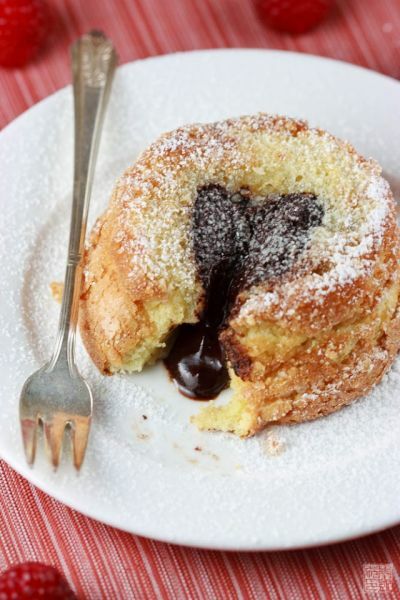 Molten chocolate cakes came to mind…perennial lurkers on Valentine’s “romantic” menus. The thing is, there’s a reason why they’re virtually un-banishable from restaurant dessert lineups – customers can’t get enough of them. The idea of warm, molten, gooey chocolate casts its spell on diners previously so stuffed they couldn’t manage another bite. I love warm chocolate cake as much as the next chocoholic, but hey, the internet doesn’t need its 1,838,394th molten chocolate cake recipe, right? I turned instead to a recipe for warm vanilla cake in Bill Yosses’ The Perfect Finish . There are several snowy-white takes on molten chocolate cake, but this vanilla and white chocolate one is a simple stunner. However, I had a couple tweaks in mind: I’m not a big fan of white chocolate, and I really wanted a dark chocolate center. When I bake with white chocolate, I usually try to balance out its intense sweetness. Use a high quality white chocolate like Valrhona; lower quality white chocolate tends to just taste like sugary chalk. Tonka beans, those South American seeds, add a fragrant, vanilla-almond-nutmeg dose of flavor to the cake batter. When the cakes are baking, the tonka beans give off the most luscious, tropical fragrance – no wonder they’re used in perfumes. Tonka beans are also known as love wishing beans in some magical traditions; if you throw seven tonka beans into a river and make a wish, it will come true. I’d rather use my beans for baking, but at least it makes them Valentine’s-appropriate! Many molten chocolate cake desserts are made from one batter that, baked properly, will remain liquid in the center. Others have you place a ball of ganache in the center of the cake batter before baking. My version falls on the more-complicated side since I make a ganache of bittersweet chocolate, cream, and framboise, then stick it into the batter, but I think it’s worth it. The dark chocolate mixes nicely with the tonka bean and also provides further counterpoint to the white chocolate, plus I love raspberry and chocolate, so I couldn’t resist the Framboise. Making molten cakes is all about the timing. I found that 17 minutes was just right for me – the cake had puffed up and mostly set through, while the very interior was still liquid. If you hit the sweet spot (so to speak), some of the batter will still be liquid and will mix with the chocolate ganache to form a swirly ribbon of goodness. Also, be careful not to push the ganache too far into the batter as it tends to sink to the bottom. I happened to capture one cake where the ganache had formed a heart shape on the cake bottom: just right for Valentine’s Day, I guess! Happy Valentine’s Day – may it be sweet! For the ganache: Melt chocolates and butter together in a small metal bowl set over a pot of simmering water, stirring occasionally. Remove from heat and stir in Framboise. Pour ganache into a container and refrigerate until firm. Meanwhile, make the cake batter: combine white chocolate and butter in a large bowl and set over a pot of simmering water. Heat, stirring occasionally, until melted and combined. Remove from heat and whisk in egg yolks, one at a time. The mixture might separate slightly because of all the fat in the white chocolate, but keep whisking and it should come back together. Add in the vanilla extract and whisk to combine. Grate the tonka beans over the batter and whisk to combine. Add flour and whisk to combine. Place egg whites and cream of tartar in bowl of a stand mixer. Whisk on medium speed until whites are very foamy. Add sugar and whisk on high until glossy soft peaks form. Spoon about a third of the meringue into the batter and fold in to lighten. Add the rest of the meringue and fold in carefully to combine. Cover batter bowl with plastic wrap and refrigerate for at least three hours or overnight. When you are ready to make the cakes, preheat the oven to 375 degrees F.
Prepare individual ramekins by buttering and sugaring the insides. Fill the ramekins about 90% full. Do not fill all the way to the top as the batter will puff up and may overflow. Place about a truffle-sized scoop of ganache into the center of each ramekin and press in slightly just so it's covered by the batter. Bake for about 17-18 minutes (bake one first as tester to see what the consistency is after 17 minutes - you don't want to overcook these cakes). The tops should be just springy when you pull them out. Run an offset spatula or knife around the sides to loosen the cake. Place a plate over the top of the ramekin and invert cake onto plate. Serve immediately. This is so lovely… and so perfect for Valentine’s Day! that sounds good, but I would have to get the oil, knowing me I would eat them all myself. I love the combination of vanilla and chocolate – I’m not the biggest fan of chocolate molten lava cakes (They are just a chocolate overload!) but this I think I could handle! so gorgeous! love white chocolate! When do you add the flour? I added in the missing step – you add it after the tonka beans. Thanks! This looks stunning. I love the thought and preparation in your recipes. I’ll try this! 1. what size ramekins do you use? I’ve had to bake it longer then your recipe calls for. 2. The grenache is really hard and difficult to get into balls. do you add cream as you mention in your write-up. It doesn’t call for it in the recipe. 3. Any tips on removing from the ramekins? I can’t get it out and have served it in the ramekins which is great but would like to turn out. Thanks.. The cake is awesome. 1. The ramekins I use about about 3 1/2 inches in diameter and hold about 3 1/2 ounces. I’m not sure if that’s the size you were using. I found that these cakes overbake easily, but if you needed to bake them longer to get them to set, go ahead. 2. I’m sorry the ganache turned out hard for you. I don’t believe I added cream to my ganache – that’s a typo in the post, and I think the ganache worked for me. You can try taking the ganache out of the refrigerator for about half an hour to let it soften up, or you can add cream if it helps – about 1/4 cup of heavy cream brought to a simmer to the chocolate and butter mixture. You don’t want it too soft or it will melt too much when baking. 3. In the recipe I mention to butter and sugar the ramekins – both the bottom and the sides. Usually this is sufficient to allow me to unmold the cakes. Hopefully this works for you? Make sure to do so generously. Hi how many does this make? This recipe makes about 10 small cakes. Thanks! For Framboise I mean raspberry liqueur or eau-de-vie. As for the Tonka beans, there may be some confusion about what I wrote. 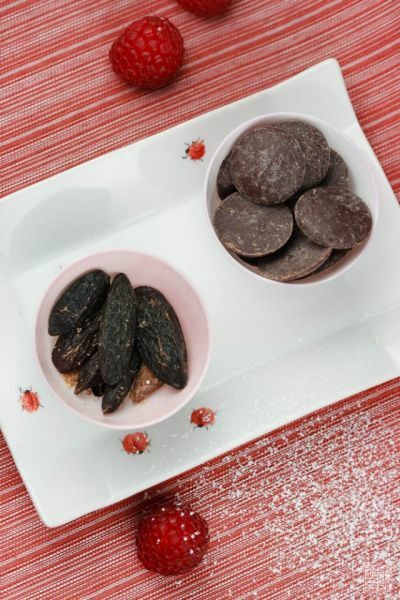 I said, “If you are concerned [about the toxicity of Tonka beans], you can always buy some Tonka bean oil and just enjoy the fragrance.” What I meant was if you are afraid of using Tonka beans in cooking due to courmarin content, you can always enjoy their scent by finding a fragrant Tonka bean oil. Tonka bean oil is not meant for consumption I would certainly not substitute it for actual Tonka beans as the concentration of courmarin could be much much higher in an oil. Hope that clears things up!